Cryptolaemus montrouzieri, also known as "the Mealybug Destroyer," is a safe, economical, and long-term solution to mealybugs. The larvae of the mealybug destroyer commonly referred to as rag mop insects. It's a kind of ladybug that is very beneficial. Tricky thing about this good guy is that it looks very much like a mealy bug. IDENTIFICATION: Adults are dark brown or black lady beetles with orange head, thorax, abdomen, and wing tips. Larvae look like white rag mops and closely resemble their prey, the mealybug. Eggs are yellow ovals. BIOLOGY AND LIFECYCLE: Complete metamorphosis, with four larval stages. Females mate soon after hatching and start laying eggs about five days later. 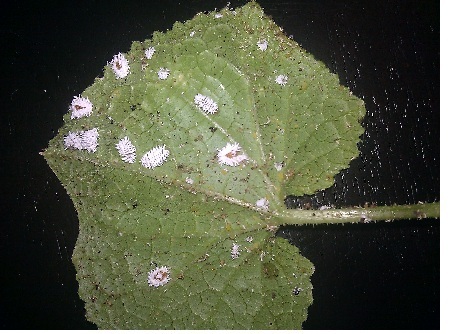 Eggs are deposited in the fluff of mealybugs. Eggs hatch in eight to ten days. Most active in sunlight and warm weather. Larvae are active for about three weeks; pupate on plants; adults emerge two or three weeks later. Adults will overwinter in mild climates. Several generations a year. HABITAT: Citrus, grapes, greenhouse plants, and house plants. FEEDING HABITS: Adults and young larvae catch prey and gobble it up. They prefer eggs and other young larvae. Older larvae will eat anything nearby. Mealybugs are their favorite food, but they will also eat aphids and other small insects. ECONOMIC IMPORTANCE: Control of mealybugs and aphids, especially in greenhouses. INSIGHT: Release two to five per infested plant in greenhouses, ten to twenty per house plant; cover with sheer curtain or floating row cover to hold beetles in place. Will freeze outdoors--for greenhouse use only. There's a lady beetle that can also help. Cryptolaemus or mealybug destroyer larvae don't have the loose white residue and and move about a little more freely. Mealybugs will sometimes have several long tails and usually are seen in clusters rather than alone like the beneficial. The mealybug destroyer's white growth looks very much like dreadlocks.